Make Your Business Directory Listing Site. iScripts EasyIndex could be operated either as a business directory site or as a classified site based on your business model and thus creating sites like craiglist in seconds. iScripts EasyIndex is integrated with a full fledged forum to ensure additional user activity within the site. Customers can have active discussions on your services. 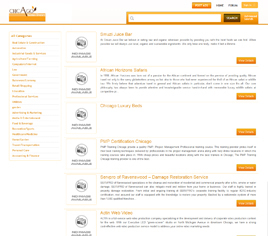 All listing pages have search engine friendly URLs. This will get your site and individual listing indexed in search engines easily in a basic Search Engine Optimization. Facebook & Twitter Plugins encourage users to share and comment on listings to help promote your site. This can socially promote your site across the web. iScripts product and their support were amazing. I got the site up and running in minutes. I have also done few customizations with iScripts. iScripts Cloud is committed to developing quality web software for our customers to create online businesses. We develop scripts encompassing viable business models. Create a successful online business of your own using any of our web scripts.